Cinnamon is the bark of one of a group of trees belonging to the same family. Many related species are marketed as cinnamon. “True cinnamon” is from Sri Lanka and is more delicate tasting than what is commonly sold as cinnamon in the United States, which is also called “cassia” or “Chinese cinnamon.” Cassia has been used in Chinese medicine for thousands of years. There are many other species of cinnamon, mainly from Asia and Madagascar. 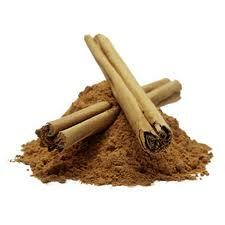 Cinnamon “sticks” or “quills” are rolls of dried bark, and can be grated into a powder or soaked in liquid. Most people buy cinnamon pre-ground. Would you believe that a mere teaspoon of cinnamon contains 28 mg of calcium, almost one mg of iron, over a gram of fiber, and quite a lot of vitamins C, K, and manganese? It’s true. It also contains about half a gram of “usable” (non-fiber) carbohydrate. In traditional medicine, cinnamon has been used for digestive ailments such as indigestion, gas and bloating, stomach upset, and diarrhea. More recently, modern medical research has turned its eye on cinnamon and is coming up with some intriguing results. It has a mild anti-inflammatory effect. It also slows the spoiling of food (which is probably related to why it was used as an embalming agent in ancient Egypt), and has anti-fungal properties as well. In one fun (but unpublished) study, researchers found that sniffing cinnamon resulted in improved brain function -– subjects did better on memory and attention tasks when taking whiffs of cinnamon as opposed to other odors or no odor. However, the potential health benefits of cinnamon that have received the most attention have to do with its effects on blood glucose and cholesterol.